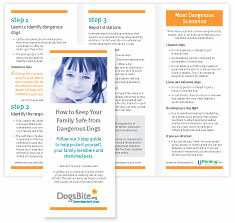 Purchase a 40-pack of dog bite prevention safety brochures and download free print quality safety flyers that will teach you how to keep your family and pets safe from dangerous dog breeds. Our dog bite prevention safety brochure has 5 panels of vital information including, how to identify the most dangerous dog breeds, how to identify the dog's owner, reporting violations and the most dangerous scenarios to avoid. The brochure is professionally printed and comes in a 40-pack so that you can quickly distribute it to neighbors, friends or a classroom. $15 plus $5 USPS priority mail shipping. The dangerous dog breed safety flyers present three powerful messages to parents, persons who work with children and community advocates. 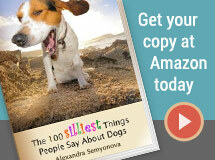 The flyers are print quality and free to download. A collection of dog bite prevention safety brochures, posters, kits and flyers from a variety of sources, as well as infographics. Please contact DogsBite.org to suggest additional materials.